THE LEASE for the Woods End pub in Bramerton is up for sale - £55,000 makes it yours according to an article this weekend in the Evening News. It's a big old pub with a proud history. A hundred-odd years ago there were "pleasure gardens" behind the building which were "justly celebrated for their rustic elegance" according to one Victorian author. It survives on its location. It's simply screams "swift pint" as you travel down river by boat. But I think good locations can make landlords lazy. Current leaseholder Martin Wormell told the paper that he relied on summer trade because "there are very few locals". Well up to a point. My request for the new owners is to think about boots as well as boats. 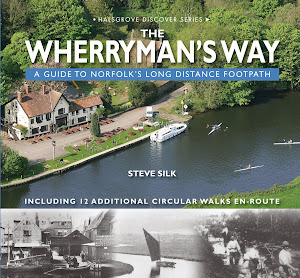 Anyone setting off early to walk the Wherryman's Way from Norwich or Whitlingham gets to the Woods End at about 10am gasping for cup of tea. What they get at that time is a closed pub. For me the successful boozers are the ones that go and search out their customers. Ask Sonia at the Surlingham Ferry House for example who opens up specially for walking groups. Or Simon at the White Horse in Chedgrave, who put on a great kiddy-friendly fireworks display the other week. Us customers are still out there you know. You just have to work a little harder to get us through the door.